Western blot analysis of extracts from various cell lines using Akt (pan) (40D4) Mouse mAb (Biotinylated). Immunoprecipitation of extracts from Jurkat cells treated with either LY294002 #9901 (1) or Calyculin A #9902 (2) using Akt (pan) (40D4) Mouse mAb (Biotinylated) and Mouse (MOPC-21) mAb IgG1 Isotype Control (Biotinylated) #4097. Immunocomplexes were pulled down using Immobilized Streptavidin (Bead Conjugate) #3419. 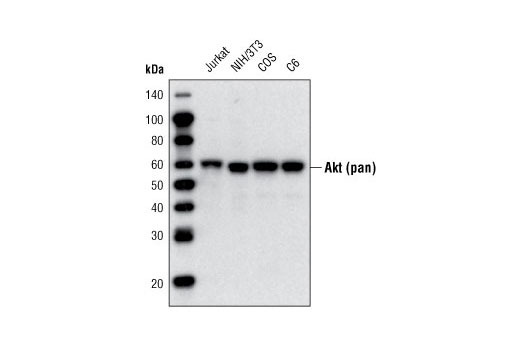 Western blot analysis was performed using Akt (pan) (C67E7) Rabbit mAb #4691. 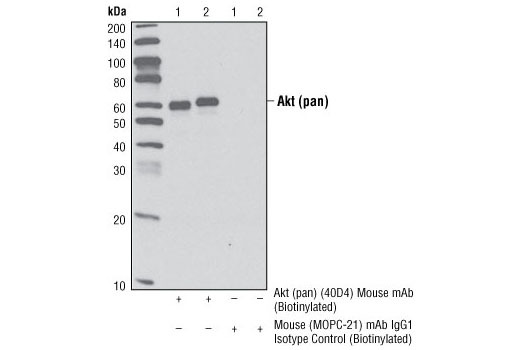 Akt (pan) (40D4) Mouse mAb (Biotinylated) detects endogenous levels of total Akt protein. This antibody does not cross-react with other related proteins. Monoclonal antibody is produced by immunizing animals with a synthetic peptide corresponding to residues in the carboxy-terminal sequence of human Akt protein. This Cell Signaling Technology (CST) antibody is conjugated to biotin under optimal conditions. The antibody exhibits the same species cross-reactivity as the unconjugated Akt (pan) (40D4) Mouse mAb #2920.